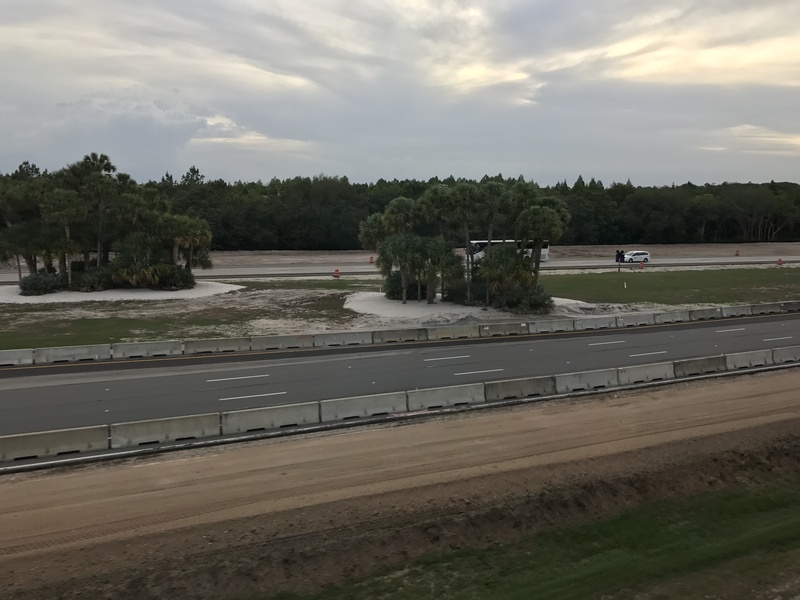 Road work continues on World Drive to enhance the Magic Kingdom arrival and departure experience. 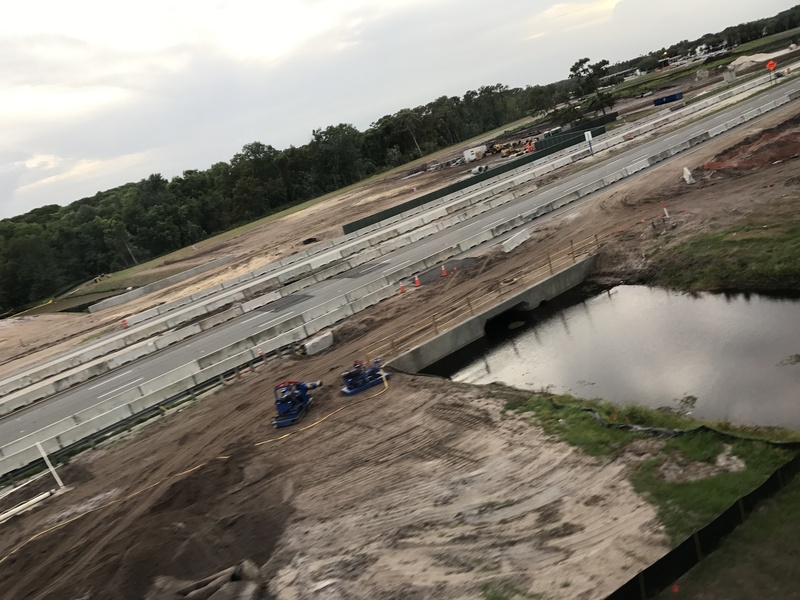 Work is underway for a new “flyover” for access to Magic Kingdom resorts and completely reworked and expanded toll plaza for the Transportation and Ticket Center. We snapped all of these pics while riding aboard the Epcot monorail. The Happily Ever After nighttime spectacular debuted a few weeks ago, taking over the park map. The poster for the show replaces Wishes under the train station. It is also sponsored by Pandora… the jewelry, not the moon. A number of Happily Ever After items can be found for sale in The Emporium. An annual passholder shirt is available behind one of the registers. Large crowds have been showing up nightly for the new show, so be sure to get there with plenty of time to spare if you care where you see it from. If you would like our thoughts on the show, you can read them here. The attraction poster phone case designs are already gone from D-Tech on Demand. There is no word as to why they were pulled, but hopefully you were able to grab one before they were removed. Some new MagicBand and phone case designs were made available recently. I continue to love the fajitas platter at Pecos Bill’s, even with the yellow rice that replaced the previous iteration. With the fixin’s bar, a kid’s meal can become a real feast. The Disney Parks exclusive Jolly Roger Pop Funko figure is available again in Caribbean Plaza. 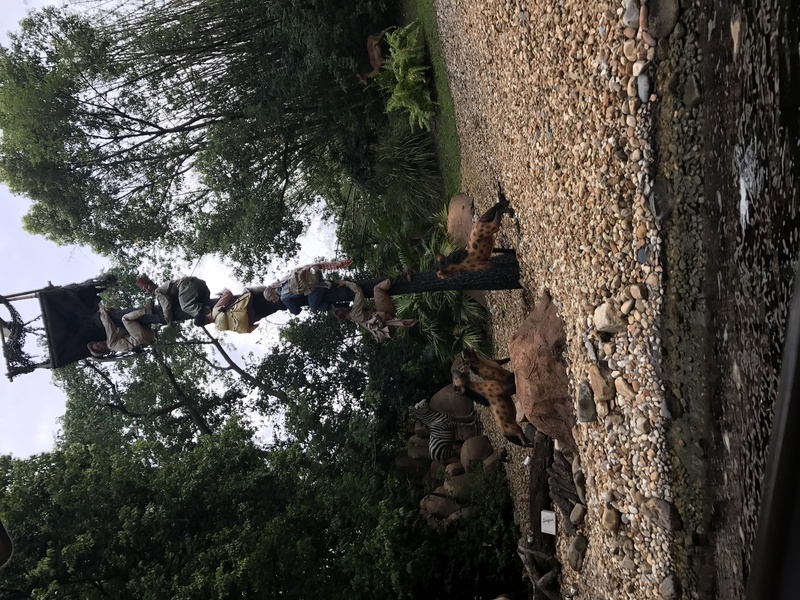 The rhino is still missing over at the Jungle Cruise. The former hot dog stand in Frontierland now sells Mickey Pretzels and Churros. The hearse is missing outside of the Haunted Mansion. A new Under the Sea Treat cupcake is available at Prince Eric’s Village Market. 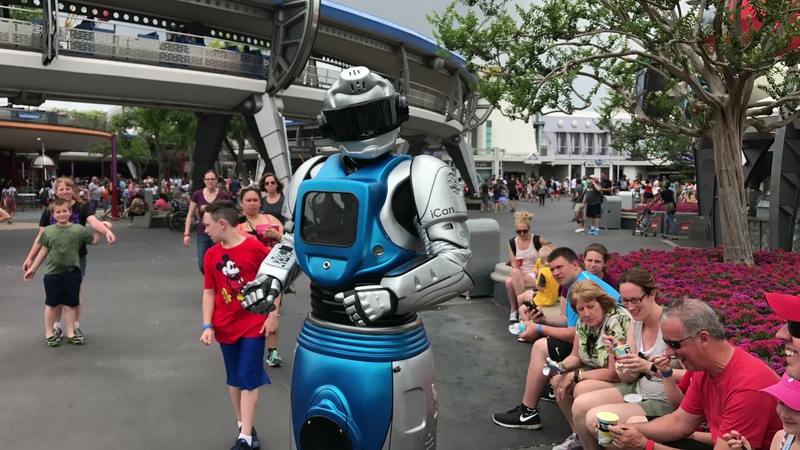 The interactive robot character iCan recently debuted in Tomorrowland at the Magic Kingdom. In my opinion, this is a million times better than PUSH ever was, engaging far more guests. He is portrayed by a pretty witty performer to boot, making this Streetmosphere for Tomorrowland, essentially. His showtimes are listed on the timed guide, so be sure to catch him next time you visit the park. Some new items found in The Emporium. This kids Rey shirt is pretty adorable. There is a ton of new mugs for sale in The Emporium. Small candy dishes from the Neverland Collection, $12.99 each. I hadn’t seen this ceramic castle before. Pandora jewelry on Main Street has a special offer on the new Fantasyland charms. With the purchase of a set, you can get a Shag lithograph. Stitch’s Great Escape is open for the Summer. Entrance and exit signs were installed at the Lunching Pad to avoid guest confusion. The new Cosmic Dance Party has taken over the stage in Tomorrowland. The Cool Ship in Tomorrowland now has Pizza Frusta. You can read out full review of the two varieties here. Work on the new outdoor covered seating continues at Cosmic Ray’s Starlight Cafe. The Cheshire Cafe now has Cheshire Cat Tails for a snack and Cold Brew Coffee. You can read our review of these items here. The water fountain near the Jungle Cruise was refurbished, but now the feeding hole gag is flat and simply painted on. 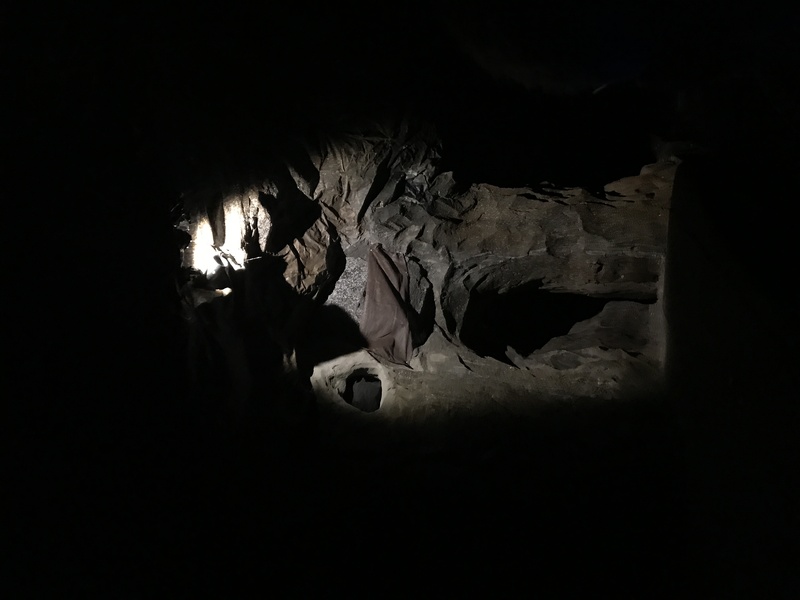 A light was left on before the drop on Pirates of the Caribbean, revealing the spot where the talking skull once was (prior to the 2006 refurbishment). Casey’s Corner has switched back to all-beef hot dogs! The macaroni and cheese hot dog is also back. Shirts for the upcoming Gay Days can be found in The Emporium, for both men and women. Some rainbow pins for sale as well. iCan looks like testing grounds for a possible interaction in Star Wars Land..
Not at all. iCan is a preexisting character built by an outside vendor that is currently contracted specifically for Tomorrowland. It’s an attempt to re-energize the land with a character offering unique from anything we’ve seen before at Walt Disney World. As Tom suggests, it appears to be fairly successful. its a shame that you have to line up so early in the giant holding pen that is now the hub. All that time guests are not spending there money . Oh well. And I thought I was the only one that made a meal out of the fixing bar! The Gay Days merchandise is interesting because I don’t think Disney World does any other official sponsorship, scheduling, or marketing for Gay Days. It’s all organized by a third party and is an “unofficial” Disney event, I’m pretty sure. I notice the merchandise is sans Gay Days’ trademarks, so Disney has even avoided licensing fees. The merchandising gurus over at Disney Parks are clever indeed! You are correct that Disney does not recognize Gay Days, but they’ve been merchandising for it for years now. Considering the amount of guest complaints and ultimately compensation guest relations deals with every year, they have to make their money back somehow. Aside from the illiterate gramatical structure you presented, there is little in the way of facts you gave in your list of reasons “gays are better” than things you wish were true diatribe. So much for peace and love. Did you also notice that there is a new video in space mountain? I believe the video that is displayed on the screens right before you step into the rocket was recently replaced, now showing a (rock-n-rollercoaster style) instruction video about how to store your bags and belongings inside the rocket, how to lower the gravity bar etc. That’s a few year’s old now, those screens weren’t there until a year or two ago. The big screen at the top of the queue is still the same and plays the old video. Not really anymore, maybe in 1980’s. Now, thankfully society has come to accept people of more diversity. Disney used to get complaints about people of ‘color’ in the park at one time in the not recent past. Thankfully the bigots are passing away, and new generation who is more loving and accepting of other humans are emerging. Disney has always been ahead of society in the welcoming Gay Days. It must be really lonely in your little world. You pulled that off of wikipedia, not a news source. And as for “cross-dressing men parading public displays of perversion” weren’t Cinderella’s step-sisters in the Main Street Electrical Parade played by men in drag for years? The people who condemn others, and who they are, like your wiki cut and paste, are usually the ones who you should really fear. Don’t believe all you read. The gay/bi/transgendered as a group usually behave MUCH better than the heterosexuals. And they tend to be way less obese. More receptive to other people who are different than they are. The list goes on. Disney has never paid the price to be on “Gay Days’, but has always promoted and supported it whole heartedly. They were out decades ago. “And it’s always been my experience that it only takes a handful of militants and/or extremists on both sides to make something like this an issue!! !”… Activists should be in that sentence… couldn’t think of the word when I wrote that post. Also sponsored by Pandora…the jewelry, not the moon! bahahahhaha???????? So…..what happened to the hearse… I noticed it was missing too! I see plenty of PDA in Disney parks, and it’s always from straight folks. Try being in line for Space Mountain sometime… LOL!! !